Oh, these look just yummy!! Thanks for sharing! i think you're right about the friends thing... baking is magical like that. A cupcake-a-thon? Perfect idea. 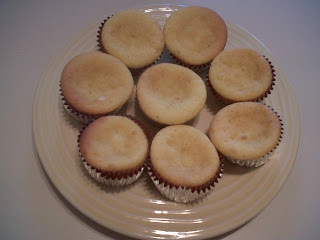 Your cupcakes look so good and the recipes looks so easy. See - just a picture and a recipe and you've gained a new friend. I'm eating them in the virtual world. Oh lordy! Can you come over and make me a batch? 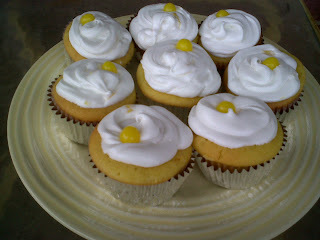 This is the second lemon cupcake recipe I've seen this week. I can seriously taste them. Yum! Girl, those look amazing! I am just now getting into cooking (I can boil water and microwave popcorn but after that it gets tricky) so these might be out of my league now, but I am going to remember them for when I am cupcake ready! 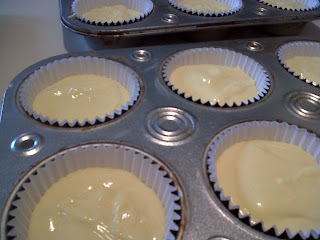 My mouth is watering for the lemony goodness. These sound delicious! I'm having a graduation party this weekend and I just might have to add these to the table.